The earliest appearances of the Old English language are found in inscriptions written using the runic Futhoric alphabet. The letters, their names, and the meaning of the names can be viewed in the image on the left. There is in fact a mnemonic poem in Old English for the Anglo-Saxon runes. Once Old English started to be used more commonly for writing, the Roman alphabet was adopted and adapted. The grapheme Æ/æ (called ‘ash’), earlier used by scribes to represent the Latin diphthong ae, came to stand as a full letter on its own. Two runes – Þ/þ (called ‘thorn’) and Ƿ/ƿ (called ‘wynn’) – from Futhoric were retained to represent sounds with no corresponding letters in the Roman alphabet. The letter Ð/ð (called ‘eth’), developed first in Irish writing, was also employed, being generally interchangeable with Þ/þ. 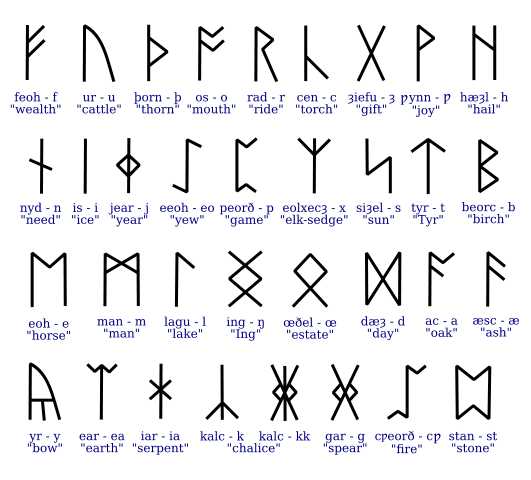 In the image below are the letters of the Old English alphabet in their manuscript form, along with the most common abbreviations found in Anglo-Saxon manuscripts. Note above that the lower case f and r actually drop below the line rather than riding on the line as they do in modern writing. Note too how s can take various forms, the second of which can easily be confused with the lower case r. Also mark how the letters p, wynn, and thorn are all quite similar to one another. Pay special attention when you come across any of these characters. As no native-speakers of Old English are currently living, there is no way to be absolutely certain how Old English was pronounced. However, thanks to the sciences of phonology, comparative linguistics, and historical linguistics, there is a well-educated idea of how Old English most likely sounded. Of course, there are some points of dispute between linguists. The following table provides links to audio files which give the approximate sound values of the Old English language. Note that while the aim is to be accurate as possible, there will undoubtedly be numerous instances when the pronunciation is off, to a lesser or greater degree, due to interference from the speakers’ native languages*. 1 a When word initial and followed by a back vowel (a, o, u) or y, or when word final and preceded by a back vowel, c is pronounced /k/. b When followed by a front vowel (æ, e, i) or the diphthongs ea or eo, or when preceded by the letter i AND not followed by a back vowel, c is pronounced /ʧ/. 2 Ð/ð and Þ/þ are interchangeable, with no difference in pronunciation or meaning caused. 3 a When at the beginning or end of a word, or when adjacent to an unvoiced consonant, f, ð/þ, and s are unvoiced: /f/, /θ/, /s/, respectively. b When falling between two vowels or adjacent to a voiced consonant, these letters are voiced: /v/, /ð/, /z/. 4 a When syllable initial and followed by a back vowel or word final and preceded by a back vowel, g is pronounced /g/. b When falling between two voiced sounds, g is pronounced /γ/. If you are unable to make this sound, simply say the approximant /w/ instead. c When followed by a front vowel or the diphthongs ea or eo, or when preceded by a front vowel AND not followed by a back vowel, g is pronounced /j/, like the ‘y’ sound in Mn.E. yes. 5 a When syllable initial, h is pronounced /h/. b When preceded by a back vowel, h is pronounced /x/. c When preceded by a front vowel, h is pronounced /ç/. 6 The exact pronunciation cannot be known for sure. In most recordings of Old English readings you will hear this letter trilled, which may or may not have been the way Anglo-Saxons would have produced this sound. The best approach is to pronounce the letter whatever way you find easiest and/or most pleasing. 7 a When preceded by c, g, and sc, the graphemes ea or eo may not be diphthongs, but rather the initial e may act as an orthographical way of showing that the preceding sound should be softened; i.e., c = /ʧ/, g = /j/, and sc = /ʃ/. b Because the grapheme eu was not allowed in Old English orthography (for unknown reasons), on such occasions eo is used instead. In these cases, the initial e shows softening of the preceding sound (see note 7a above), and o = /u/, ō = /uː/. For example, Geōl, alternatively written as Iūl, is equivalent in sound and meaning to Mn.E. Yule. 8 This is another example of a phoneme whose exact nature isn’t known. It could represent the diphthong /ie/ and /iːe/, or alternatively it may simply represent the sound /ı/ and /ıː/. 9 a When followed or preceded by a front vowel (æ, e, i, y) or the diphthongs ea or eo, sc is usually pronounced /ʃ/. b When followed or preceded by a back vowel, sc is sometimes pronounced /sk/. A few points should be made. First off, all letters – with the occasional exception of e, see note 7b above – are pronounced in any given Old English word. For example, the h in words such as hring (ring) or mearh (mare) should be clearly articulated. Also, doubled consonants are distinguished from singular consonants. A word like scieppan, therefore, should be pronounced as sciep-pan, NOT as scie-pan; likewise, the word sunne is said as sun-ne, not su-ne. And in a word such as weall, the ‘l’ sound should be held longer than in a word like engel. Secondly, as the above table may have made apparent, at times there will be some doubt as to the exact pronunciation of a word, with eo, g and sc being the most notorious troublemakers. For example, the sc is pronounced as /ʃ/ in wȳscan (to wish) but /sk/ in fiscas (fish, pl.) despite the fact that in both words the digraph is preceded by a front vowel and followed by a back vowel. Lastly, while manuscripts have various [not very well understood, and quite possibly superfluous] marks over some letters, vowels with macrons over them (e.g., ā, ē, etc.) are a modern, not Anglo-Saxon, convention designed to help with accurate pronunciation and with making distinctions between words that are homographs in the manuscripts. Word-stress is relatively simple in Old English. As a general rule, the first syllable of a word receives the stress. However, verbs with prefixes are never stressed on the prefixes, but rather on the first syllable falling after the prefix (i.e., on the verb root). Take for example the Old English words for “[an] answer” and “to answer”: the noun answaru, stressed ANswaru, and the verb answarian, stressed anSWARian – this is because the ‘an-‘ is actually a prefix. Modern English still occasionally follows similar patterns – compare for example the noun “a PREsent” which has the stress on the first syllable (the prefix ‘pre-‘), versus the verb “to preSENT” which has the stress on the first syllable after the prefix. In compound words – that is, two separate words which are compounded together to form a new word – the main stress falls on the first syllable of the first element of the compound word, and a secondary stress falls on the first syllable of the second element. So in dēofolwītga (soothsayer, from dēofol “devil” + wītega “wise man”) the primary stress is on the syllable ‘dēo’ and a secondary stress falls on ‘wīt’. This final point is extremely important both for Old English grammar as well as for Old English poetical meter. It is therefore necessary that you fully grasp how syllable length works in Old English. Luckily, it isn’t difficult to understand and learn. When a single consonant is followed by a vowel, it belongs to the following syllable; otherwise it belongs to the preceding syllable. So the word scipu has two syllables (sci-pu) because the p is followed by a vowel, while the word scip has only one (scip) as no vowel follows p. When two consonants are flanked on each side by a vowel, the first consonant belongs to the preceding syllable while the second consonant belongs to the following syllable; otherwise, both consonants belong to the preceding syllable. The word ende thus breaks down into two syllables as en-de, but weall is a single syllable. Long syllables are those which end with a consonant (thus forming a so-called ‘closed syllable’) and/or include a long vowel/long diphthong – ā, ǣ, ē, ī, ō, ū, ȳ, ēa, ēo, īe. The verb rīsan has two long syllables: rī-san; ‘rī’ has a long vowel and ‘san’ is closed. Short syllables are those which end with no consonant (a so-called ‘open syllable’) and contain a short vowel/short diphthong – a, æ, e, i, o, u, y, ea, eo, ie. The word lacu, for example, has two short syllables: la-cu; both syllables are open and contain short vowels. Note that changes can occur that will cause syllables to change length. For example the Old English word for “whale” in the nominative singular is hwæl, a single long syllable because it is closed, but in the nominative plural it is hwalas, whose first syllable is now short – ‘hwa’ contains a short vowel and is open – and which has acquired a second syllable that is long – ‘las’ contains a short vowel but is closed. A couple final points important for poetical meter concerns disyllable words. In a disyllable word containing two short syllables, those two syllables may, for the purposes of meter, be taken together to count as a single long syllable. A word like spere (spear), with the two short syllables spe-re, can be employed as a single long syllable when needed by the poet. In a disyllable word whose first syllable is long, the second syllable is counted as being short even if it is long due to its being a closed syllable. Wǣpen (weapon), for example, has two long syllables, but if required by meter it could be counted as long syllable + short syllable. 1) Practise your recognition of manuscript letters by reading the text in the left column below. The modernized letters are in the right column for the sake of comparison. For those who might not realize it, these are the opening lines of Beowulf. Click to listen to a dramatic reading of the opening lines of Beowulf from Exercise 1 and click to download the answer-key for Exercise 2. The Electronic Introduction to Old English: Pronunciation by Peter S. Baker – the pronunciation guide was constantly referenced in the writing of my own guide. Here are a few books to help you along your Old English adventure. The first two are introductions to Old English (grammar, syntax, vocabulary). The third book is a good resource for building up your Old English word bank. The final book is particularly good for those with an interest in how Old English compares with the other old Germanic languages. *Special thanks to Endevide (the female voice) for the hours of recording she suffered through for the sake of this guide, and for her Midas touch in editing the images on this page. Excellent! I learned more about pronunciation here than I have at other sites. Thanks Endevide! That dramatic reading was great! Where can I get the whole thing? I listened to Michael Drout read but it doesn’t sound like the same person. Endevide is the female voice, and I (Christopher) am the male voice of the short sound clips. The dramatic reading was done by Benjamin Bagby – you can find videos of his work on YouTube. Drout is a professor who is responsible for the Anglo-Saxon Aloud page. I, as an Ancient Languages researcher, find your page extremly usefull. Keep up the good work. This introduction is most useful! My high school students’ eyes have been opened wide. Thank you. Very nice work. Can anyone supply guidance on the pronunciation of FINAL “c”. when I studied OE, we were told to pronounce “ic” (= “I”) as “itch” (palatalized). Surely it’s “ick” (hard c), cf the ModGerman “ich” = I, On the other hand we have words like swylc, hwylc, and even eac (such, which, also/”each?”) in which maybe the c is palatalized? (Predictably, and maybe under Viking influence, Northern forms kept the hard c, e.g., Scots “ilk” .) Is it possible that final c is HARD C (= “K”) unless it’s preceded by a liquid consonant? (L or R) Any thoughts? Okay, we’d need a better expert in Germanic linguistics and phonology than I am in order to give a thorough, scientific answer. Due to my lack of knowledge, I often have the same sort of inquiries. How, for example, does the word lician give us ‘like’. Seems that under the flanking of the i’s that the c should have been palatalized, even if we take into consideration that it’s a verbal infinitive form; perhaps it stayed /k/ through analogy with over verbs like secan? (Never underestimate the power of analogy in language). Maybe two competing forms formed, one with and another without palatalization, and the non-palatalized form won the day? I’d point out that ‘ich’ in standard High German isn’t pronounced as /ik/ but as /iç/, and in certain dialects it’s even /iː/. So, in fact, that gives a perfect example of the process of palatalization leading to complete loss of a consonant. I’d imagine in English the word went from /ik/ to /iʧ/, due to the palatalizing effect of the preceding i. The eventual disappearance of the final consonant resulted in compensatory vowel lengthening to /iː/, a common phenomenon in language development. After the Great Vowel Shift this got diphthongized to /aɪ/. We see nearly the same thing in the example you gave with words ending in -lic, minus just the final diphthonization. I’d say that most likely the c is palatalized in at least late Old English – although it was quite possibly a hard /k/ at an earlier stage of the language – and given that English stress falls on the first syllable, over time the palatalized consonant was completely lost. Words that have tended to keep the palatalized c’s are those which are monosyllabic. I don’t think it is directly connected to liquid consonants as the palatalization can be seen in words totally lacking liquids. If you know Irish in its various stages, you can see similar processes are in play. I’d say in language you rarely have a straight disappearance of a final /k/ (without some middle step), but you can frequently find loss of palatalized consonants. Concerning some regions having kept a hard /k/ sound, as you’ve mentioned this may be a result of language contact with Old Norse and/or simply divergent linguistic changes. Interestingly, Scots has retained the hard /k/ in places where it has become palatalized in modern Scandinavian languages. Thank you very much for all the hard work! I will definitely be visiting and revisiting this page for many weeks to come as I learn to pronounce the alphabet. It is very helpful! Reblogged this in my OE learning journal. Really appreciate the amazing work you have done, and sincerely hope there would be more follow-up lessons posted online. Here I was, just trying to get the feel of some pronunciation to support my enquiries into the derivations of some words connected with roads – and I find this site !! I am blown away (and mindbefoggled) If only I could take this all in and actually remember it. You have already helped so far by explaining why some letters have a short dash above them – I now need to work out, or find out, what dots and crescents do to a letter. Basically, I shall also be looking for an explanation of whether a vowel “says its own name” or some other sound. In modern English I remember as a small infant learning that if a word had an “E” at the end the vowel in the middle “said its own name” I wonder if there is a rule for Anglo Saxon ? I do have a smattering of German left in my remaining brain cells and that can help a little I think. Fantastic discovery – I’ll be back ! This is such a useful post – thank you! I was wondering, though, what about when “w” appears at the end of a word, e.g. snāw? How would you pronounce that? Thanks! Oh sorry, I was just going back through the comments and realized I never responded to yours! :-s I imagine final ‘w’ theoretically would have been pronounced as /w/ but probably in a number of cases ended up realized as something akin to a light /u/ with corresponding vowel breaking. What’s your opinion? I wasn’t sure, that’s why I asked! I thought it probably would add something of a /u/ sound when following a vowel, as you say. Old Saxon had “sneu” and Old High German “sneo”, so I think we’re probably right, hahaha! I’m looking for an audio version of the pronunciation so that I can be as accurate as possible in my emphasis of words, etc. I would greatly appreciate any help! I have one doubt: do the elements of compounds and suffixed and prefixed words have to be transcribed as independent elements or as a single one? If the transcription goes independent it would be: wiθ- drivan (more or less). But if it goes as a single word it would be: wiðdrivan. I don’t know if you get the point. I don’t understand this and would appreciate any help. Hi Marcos, I see no reason for there not to have been internal sandhi (so in other words, I suppose native AS speakers would have said “wiðdrivan”, using your example). As linguists we tend to break down words into their individual elements for analysis; a typical person on a typical day engaged in typical conversation wouldn’t overthink language in that way, and his/her pronunciation would most certainly include both internal and external sandhi as occurs naturally in speech. Great question though, and I definitely invite anybody more knowledgeable or with more background to chime in! I wish had this site back when i was at Uni rather than trying to figure out the pronunciation of words for Sweet’s Primer where the pronunciation was often give through an example in some other language that I didn’t speak! I feel your pain! Pronounce ___ like Swahili ___ with a slight twinge of Urdu ___. Hahaha! How do you pronounce two consonants that are the same without a vowel: I’m from Louisiana, myself, so I find it hard — I natively want to pronounce, say, “-pp-” as: [p̆̚p] a short silent “p” position, that is barely held, and then finished with [p]. When will there be other lessons up? Or will they be purchaseable — either is fine. As lessons progress, will old English writing be compared to the words written in what Futhork inscriptions we have: Stone or Handwriting, because I would like to indipendantly find out when Kalk was used and when Cen was used, also the same for Gar and the Gyfu wer used. I am of the mind that Cen was Palatal, /C/, and kalk was /k/, but that’s because I’ve always, since little, pronounce “C” as /C/ and “K” as /k/. Personally I think it was what ever was easiest to pronounce. For instance: [Cen] is easier to say than: [ken] and preserve the vowel /e/, do to the articulation of: /e/ then having to force your tongue into: /k/ is too hard. The same, [ak] is easier to say than: [aC] but [aCi] is easier than [aki]… of course those weren’t real words there, save for [aCi], and that’s Spanish LoL 😛 and the vowel is wrong. I have this strange desire to not only read Beowulf for the First time in AEnglisc, but transliterate it into the Futhorc. As you can probably guess by my logic, I am pronouncing “Futhorc” as: [fuθork], but I am not. I am struggling to pronounce it as: [fuθoɹC], as I naturally want to pronounce it as any of: [fyˑθ̺̪oɻk], [fyˑθoɹc], or [fyˑθ̺̪oɽc]. On the “R” I am of the mind that, say “-yr-” should’ve appeared it would’ve been pronounced: [y˞] slightly rhoticized, in between to certain sounds, like say if: “-ere-” would’ve appeared, then it’d be: [eɾe] or [ere]. From my mind, say: “-rr-” then that might’ve been: /ɹ/, because /rː/ is stupid, but then again, when reading Early Modern English, I want to pronounce “Rock” as either: [ɻŏq] or: /ɹŏq/, but acknowledge it meant it was pronounced: /ɻok/, probably.